For this week's post, we have a new paper on ceratosaurs by Delcourt (2018). The paper discusses anatomy, behavior and such (and provides some good photos of Limusaurus), but here I only want to deal with the phylogenetic taxonomy proposed. Delcourt uses the topology of Analyses 1 and 2 of Wang et al. (2016) from the Limusaurus ontogeny paper, which seems to have been well done from what I've seen. Tons of taxa, tons of characters, and some sage commentary on OTUs and anatomy. 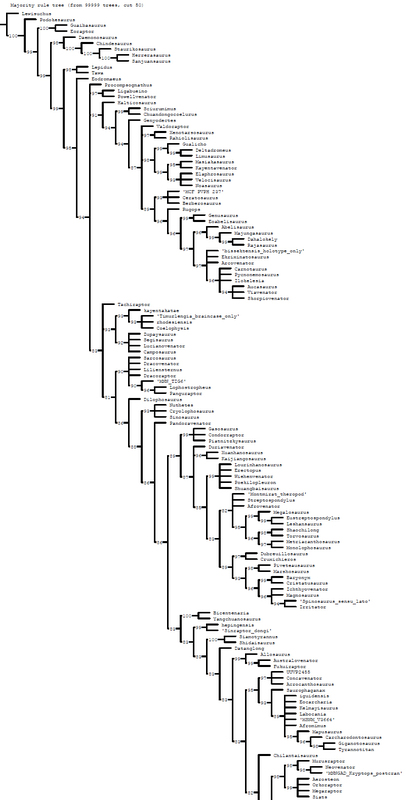 It's a shame the full tree is never presented in the paper, and I hope that analysis or a derivative is used for a stand alone phylogeny paper in the future. Wang et al. interestingly find noasaurids to group with Elaphrosaurus, Limusaurus, Spinostropheus and Deltadromeus in a clade outside ceratosaurids plus abelisaurids, which is also what the Lori analysis found weirdly enough. Ceratosaur portion of Analysis 1 and 2 of Wang et al. (2016). Numbers are GC jacknife supports from Analysis A (above branches) and B (below branches). After Wang et al., 2016. So I have no issue with the phylogeny, but Delcourt's proposed phylogenetic taxonomy is... bad. Let's start with his new taxon- Etrigansauria, named after DC Comics character Etrigan who is a demon bound to the human Jason Blood. Now I love the DC Animated Universe as much as the next person, but what's the phylogenetic definition of Etrigansauria? "The most inclusive clade containing Carnotaurus sastrei and Ceratosaurus nasicornis but not Noasaurus leali." But wait a second, we already have a Carnotaurus plus Ceratosaurus node-based clade- Neoceratosauria from Novas 1991, most recently refined by Hendrickx et al. (2015) as "The least inclusive clade containing Ceratosaurus nasicornis and Carnotaurus sastrei." So if we have a standard topology with abelisauroid noasaurids, Etrigansauria self destructs, and if we have a Wang et al. style topology then Etrigansauria is just a junior synonym of Neoceratosauria. [Edit: I noticed when commenting on the journal's website that the definitions are slightly different in that Etrigansauria is stem-based, so that there could be non-neoceratosaurian etrigansaurs under a Wang et al. style topology. But the only such taxon in Wang et al. 's trees that were used is the skull-less Berberosaurus, which falls out other places in their other analyses- elaphrosaurid, stem-ceratosaur, etc.. Indeed, I doubt Delcourt had this distinction in mind because his figure 1 actually places Etrigansauria at the neoceratosaur node, not the stem containing Berberosaurus as his definition would have it.] The word "neoceratosaur" only appears once in Delcourt's paper, as a brief mention- "In some analyses, Berberosaurus is considered as a basal ceratosaurian, a neoceratosaurian, ...". This seems weird, and I urge everyone not to forget Novas's decades of work on these animals, and use Neoceratosauria instead of Etrigansauria published twenty-seven years later. Delcourt's other big blunder is with Abelisauroidea versus Ceratosauroidea. Delcourt uses Wilson et al. 's (2003) definition of Abelisauroidea which is (Carnotaurus sastrei + Noasaurus leali). That's a bad definition since it doesn't include Abelisaurus as a specifier, but we'll ignore that for the moment. He also uses Wilson et al. 's definition for Abelisauridae- (Carnotaurus sastrei < - Noasaurus leali). Which is also bad in not including Abelisaurus, but whatever. Using these bad definitions in Wang et al. 's phylogeny gets us the bad result of making Ceratosaurus an abelisaurid abelisauroid. Which Delcourt correctly notes it can't be, because Ceratosauridae/oidea has priority over Abelisauridae/oidea. Delcourt's weird solution is to instead use Wilson et al. 's Abelisauroidea definition for Ceratosauroidea, so that Ceratosauroidea is now Carnotaurus plus Noasaurus. Ack! Okay, first of all, that doesn't work because Ceratosaurus nasicornis needs to be an internal specifier of Ceratosauroidea (Phylocode Article 11.7!). Second, we have much earlier and better definitions to use than Wilson et al.'s. Holtz (1994) defined Abelisauroidea as taxa closer to abelisaurids than Ceratosaurus, which can be easily modified to (Abelisaurus comahuensis < - Ceratosaurus nasicornis). See, that's a good definition that follows Article 11.7, maps correctly on to Novas' (1991) topology when he created the taxon, and never includes Ceratosaurus to avoid that whole kerfuffle. In Wang et al. 's topology, noasaurids aren't abelisauroids, simple as that. What is Ceratosauroidea? It's only ever been defined before this as an alternative to Neoceratosauria when that clade was thought to be sister to coelophysoids, so those definitions make it a junior synonym of Neotheropoda sensu Bakker. Given current taxonomy, it doesn't seem like a useful clade to redefine unless what we call Ceratosauridae now expands a LOT. The rest of Delcourt's definitions aren't any better. That's the standard ever since Rowe (1989) so is fine. That's the original definition from Wilson et al. (2003), and is fine. This is attributed to Rauhut and Carrano (2016), but that's wrong. Those authors used the better definition "all noasaurids that are more closely related to Elaphrosaurus than to Noasaurus, Abelisaurus, Ceratosaurus, or Allosaurus" to cover alternative topologies so that we don't get stupid results like abelisaurid Ceratosaurus. Ditto here. Delcourt falsely attributes that definition to Rauhut and Carrano, but they actually used the much better "all noasaurids that are more closely related to Noasaurus than to Elaphrosaurus, Abelisaurus, Ceratosaurus, or Allosaurus." As an obvious illustration of why Delcourt's definition is bad, in a standard topology where Noasaurus is an abelisauroid but Elaphrosaurus is not (e.g. Carrano and Sampson, 2008), Ceratosaurus and abelisaurids are all noasaurines. Ceratosauridae: (new definition) the most inclusive clade containing Ceratosaurus but not Carnotaurus. We actually already have an equivalent definition for this family- Rauhut (2004) wrote "the name is used here for a clade containing all ceratosaurs that are more closely related to Ceratosaurus than to abelisaurids." But even if one disputed that because Rauhut stated "it is premature to give such a formal definition at present", Hendrickx et al. (2015) defined it as "The most inclusive clade containing Ceratosaurus nasicornis but not Carnotaurus sastrei and Noasaurus leali." Abelisauridae: (new definition) the most inclusive clade containing Carnotaurus but not Ceratosaurus. Article 11.7! Abelisaurus comahuensis needs to be an internal specifier for Abelisauridae, again why is this so hard? No argument for using Carnotaurus makes any sense. 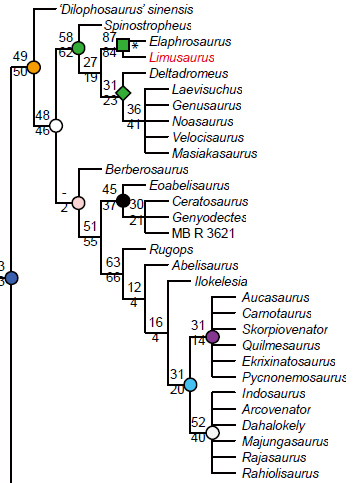 Sure it's more complete, and may be more deeply nested, but if Abelisaurus somehow ends up not closer to Carnotaurus than Ceratosaurus, you're not going to be calling the Carnotaurus group Abelisauridae anyway. The sad part is that we actually do need a new good definition for Abelisauridae. Novas' (1997) definition is a node including the fragmentary Xenotarsosaurus which has an unstable position in recent analyses. Rowe et al. 's (1997), Wilson et al. 's (2003) and Sereno's (perpetually in press) definitions all use Carnotaurus. 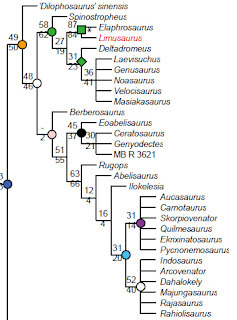 Sereno's (1998) is a node using Abelisaurus and Carnotaurus that would work (except for Rugops) in Wang et al. 's topology, but exclude all taxa except the two specifiers and Aucasaurus in Filippi et al. 's (2016) topology, for instance. Plus none of the stem-based definitions exclude Ceratosaurus. Delcourt's definition is bad because if noasaurids are abelisauroids as in most topologies, noasaurids are abelisaurids. Here's what a good definition of Abelisauridae looks like- All taxa more closely related to Abelisaurus comahuensis than to Ceratosaurus nasicornis, Noasaurus leali, Elaphrosaurus bambergi or Allosaurus fragilis. Someone publish that. Ceratosauria phylogeny from Filippi et al. (2016), after Filippi et al. (2016). That's fine and classic, taken from Sereno (1998) who named the clade. Honestly, I think this and Abelisaurinae have proven to be pretty useless due to the varying position of Abelisaurus and should probably be ignored by future authors. In Filippi et al. 's trees, Carnotaurus is the only carnotaurine, but in Wang et al. 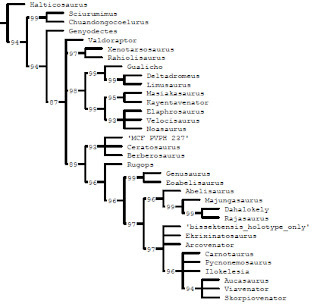 's trees all abelisaurids except Abelisaurus and Rugops are. 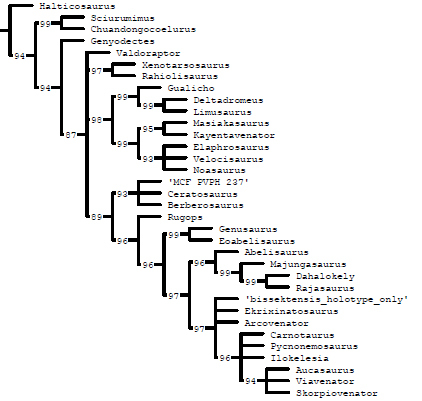 Instead of abelisaurines vs. carnotaurines, the more useful split seems to be between majungasaurs and brachyrostrans (in the Lori trees too, incidentally). It would be great to have a name for the Majungasaurus plus Carnotaurus node too, so we could easily refer to "basal" abelisaurids like Rugops, Abelisaurus and Ilokelesia in Wang et al. 's trees, Kryptops and Rugops in Filippi et al. 's trees, or Rugops, Genusaurus and Eoabelisaurus in the Lori tree. Here, Delcourt correctly notes that in Wang et al. 's topology, Majungasaurinae as originally defined falls out inside Carnotaurinae. So it's yet another case where the Phylocode clashes with the ICZN. Which is a fair observation, but I think the better solution would be to propose Majungasauria for that clade, which could go in either position and work fine. The original definition, so that's fine. 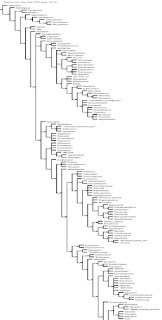 Furileusauria: Most inclusive clade containing Carnotaurus but not Skorpiovenator. This is credited to Filippi et al. (2016), but those authors actually had Ilokelesia and Majungasaurus as external specifiers too. Since those two are also outside Furileusauria in Wang et al. 's trees, I don't see why the change was made. I'm also not sure how useful the clade Furileusauria is yet. It obviously works in Filippi et al. 's phylogeny, but has uncertain content in Wang et al. 's since Carnotaurus and Skorpiovenator are part of a polytomy. I should note here that it's not at all certain whether Wang et al. 's or Filippi et al. 's trees are better supported. Filippi et al. includes 6-8 more ceratosaur taxa and 416 characters with just a few outgroups, while Wang et al. have 744 characters but also densely sample and test coelophysoids and have quite a lot of tetanurines, so many of those characters are probably not parsimony-informative for ceratosaurs. Follows Article 11.7, works in everyone's topologies, ta da. References- Rowe, 1989. A new species of the theropod dinosaur Syntarsus from the Early Jurassic Kayenta Formation of Arizona. Journal of Vertebrate Paleontology. 9(2), 125-136. Novas, 1991. Phylogenetic relationships of ceratosaurian theropod dinosaurs. Ameghiniana. 28, 401. Holtz, 1994. The phylogenetic position of the Tyrannosauridae: Implications for theropod systematics. Journal of Paleontology. 68(5), 1100-1117. Novas, 1997. Abelisauridae. In Currie and Padian (eds.). Encyclopedia of Dinosaurs. Elsevier Inc. 1-2. Rowe, Tykoski and Hutchinson, 1997. Ceratosauria. In Currie and Padian (eds.). Encyclopedia of Dinosaurs. Elsevier Inc. 106-110. Sereno, 1998. A rationale for phylogenetic definitions, with application to the higher-level taxonomy of Dinosauria. Neues Jahrbuch für Geologie und Paläontologie Abhandlungen. 210(1), 41-83. Wilson, Sereno, Srivastava, Bhatt, Khosla and Sahni, 2003. A new abelisaurid (Dinosauria, Theropoda) from the Lameta Formation (Cretaceous, Maastrichtian) of India. Contributions from the Museum of Paleontology. 31(1), 1-42. Rauhut, 2004. Provenance and anatomy of Genyodectes serus, a large-toothed ceratosaur (Dinosauria: Theropoda) from Patagonia. Journal of Vertebrate Paleontology. 24(4), 894-902. Hendrickx, Hartman and Mateus, 2015. An overview of non-avian theropod discoveries and classification. PalArch's Journal of Vertebrate Palaeontology. 12(1), 1-73. Filippi, Mendez, Juarez Valieri and Garrido, 2016. A new brachyrostran with hypertrophied axial structures reveals an unexpected radiation of latest Cretaceous abelisaurids. Cretaceous Research. 61, 209-219. Rauhut and Carrano, 2016. The theropod dinosaur Elaphrosaurus bambergi Janensch, 1920, from the Late Jurassic of Tendaguru, Tanzania. Zoological Journal of the Linnean Society. 178(3), 546-610. Wang, Stiegler, Amiot, Wang, Du, Clark and Xu, 2016. Extreme ontogenetic changes in a ceratosaurian theropod. Current Biology. 27(1), 144-148. Delcourt, 2018. Ceratosaur palaeobiology: New insights on evolution and ecology of the southern rulers. Scientific Reports. 8:9730. Well I missed a week, but this post is on Wang et al. 's (2018) new paper on confuciusornithiforms. Note that's not confuciusornithids, as that family was poorly defined by Chiappe et al. (1999) as Confuciusornis plus Changchengornis. Martyniuk (2012) thus defined Confuciusornithiformes as the stem-based clade of taxa closer to Confuciusornis than Enantiornis and Passer. The Lori analysis did recover some non-confuciusornithid confuciusornithiforms, so the distinction seems valuable. In any case, I spent a lot of time working out the taxonomy of these taxa back in 2002, the results of which have made their way into the Database. So how do Wang et al. 's interpretations compare? This was erected by Hou (1997), but we both agree it's just a Confuciusornis sanctus. There are a few characters Hou mentions as distinctive (ten free caudals, slightly developed olecranal fossa, radial groove and patella) but are not in his diagnosis, so go unmentioned by Wang et al.. But based on Hou's inaccuracy in other areas, I maintain these are probably misinterpretations. Also named by Hou (1997), this is just based on a hindlimb. Wang et al. provide good photos and interestingly find the specimen is a left leg instead of a right one. While Chiappe et al. thought the lack of proximal tarsal fusion was equivocal, Wang et al. view it as genuine and ontogenetic. I said "Finally, Hou lists "metatarsal V is present and is isolated, except for its articulated proximal end", but it is present in C. sanctus as well. The discussion indicates it is metatarsal V's robusticity and lack of fusion with the tarsometatarsus that Hou belives is unique. Examination of photos leads me to believe that what's identified as metatarsal V is actually a broken proximal end of metatarsal II. This would explain why the metatarsus is so narrow, and why metatarsals I and V are on the same side." Wang et al. confirm this with "Furthermore, the element identified as metatarsal V by Hou (1997) is in fact the incomplete metatarsal II, as indicated by its medial position and robust size." We both agree it's indeterminate within confuciusornithids. 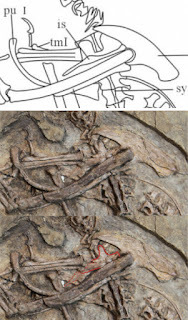 Holotype of Confuciusornis chuonzhous (IVPP V10919) as illustrated in Hou (1997) (left) and Wang et al. (2018) (right). Regarding only known specimens (holotype and paratype), Wang et al. report "unfortunately, neither of these specimens can be located at this time." This is yet another example of IVPP specimens being lost and is rather concerning. I wrote "(proposed) narrow, tapered and vertical ascending process of maxilla" as a diagnostic character, and Wang et al. agree and write "we identify two new cranial features diagnostic of C. dui: the dorsal process of the maxilla rapidly tapers dorsally, forming a triangular shape in lateral view." Of course, Elzanowski et al. 's (2018) recent paper shows that we were all wrong about the maxilla in Confuciusornis and that it actually has a low internal ascending process and no external ascending process. Their other supposedly new cranial feature is "the ventral margin of the surangular is straight in C. dui lacking the ventral process seen in C. sanctus and E. zhengi", but this was actually listed in its original description ("without the distinctive anteroventral expansion of the dentary found in C. sanctus") and is a plesiomorphy anyway. 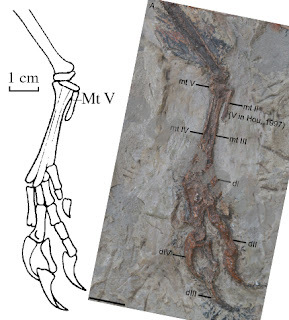 The authors interestingly report some Confuciusornis specimens have a posteriorly grooved furcula like Changchengornis. They also interpret the supposed maxillary fenestra more correctly than Chiappe et al. (1999) as being within the lacrimal, although missing Elzanowski et al. 's idea that the lacrimal and ethmoid complex are fused. Finally, they include "tarsometatarsus without plantar excavation" in the diagnosis despite that being plesiomorphic compared to Confuciusornis (sanctus, at least). This is a very useful section of the paper, since both species of the genus were described in Chinese and only Chiappe et al. (2008) have examined their validity in print, albeit briefly. Regarding J. yixianensis, I wrote "Characters like "braincase small" and "second manual digit not particularly expanded" appear to differ at first glance, but I have a feeling examination of the specimen would show otherwise" and indeed Wang et al. provide excellent photos showing the skull is exposed in lateroventral view and that manual phalanx II-1 is not exposed (covered by manual ungual I and sediment if present). Supposedly different in having more than 12 dorsal vertebrae, I said "Confuciusornis may have had over twelve dorsal vertebrae" but it seems the answer's actually the opposite and that the posterior dorsals of J. yixianensis are missing so that it can't be shown to have twelve dorsals in the first place. For J. zhangjiyingia, Chiappe et al. (2008) stated the supposed quadratojugal-orbit contact cannot be confirmed, and Wang et al. show that this portion of the 'quadratojugal' is actually part of the postorbital. Indeed, one of the weird findings of Elzanowski et al. is that the quadratojugal of confuciusornithids has yet to be identified, and that laterally exposed bone in that area of the skull could easily be non-homologous elements as in some recent birds. In any case, the authors agree with Chiappe et al. and I that Jinzhouornis is a junior synonym of Confuciusornis sanctus. I proposed Eoconfuciusornis zhengi was closer to Confuciusornis than Changchengornis and potentially closer to Confuciusornis sanctus than C. dui based on characters like the surangular process invading the external mandibular fenestra. I said "The only character which would place zhengi outside Confuciusornis (sanctus + dui) is the absent humeral foramen, but this may be ontogenetic and seems to be developing as a fossa in the specimen", and the authors note referred specimen BMNHC-PH870 (Navalon et al., 2018) has a humeral foramen. BMNHC-PH870 wasn't published when I examined confuciusornithid taxonomy, but would seem to have relevance. Notably Wang et al. didn't defend placing Eoconfuciusornis outside Confuciusornithidae or diagnose the genus Confuciusornis, although it did fall out at the base on Confuciusornithiformes in their tree. In a rare exception to the norm, I think the authors are correct to synonymize a taxon that I kept separate. Turns out its original describers were wrong in claiming the humeral foramen was absent and that manual phalanx I-1 is subequal in width to III-3. Pending detailed examination of the situation, I agree with Wang et al. that C. feducciai is just a large C. sanctus with longer wings than average. Holotype of Confuciusornis jianchangensis (PMOL-AM00114) pelvis in right lateral view as illustrated by Li et al. (2010) (top), photographed by Wang et al. (2016) (middle) and interpreted here (bottom). Continuing the exceptions, I might have been wrong not to synonymize this species with C. sanctus. I've so far agreed with Cau's (2010) blogpost that found this species to share some characters with Ornithothoraces. However, Wang et al. provide better photos that show the ornithuromorph-style ischium illustrated by Li et al. (2010) isn't there. Instead, there is a large proximodorsal process like Confuciusornis and enantiornithines, and the distal ischium is missing so we can't tell if a mid-dorsal process was present or what the ischiopubic ratio was. While Li et al. provided a short fibular measurement suggesting complete and reduced fibulae, the right fibula definitely goes underneath the tibia and the left one might. Wang et al. correctly note metatarsal V is easily lost or hidden, so that it's not necessarily truly absent. The final supposedly different character is the reduced dorsal count, but I can't verify Li et al. 's cervicodorsal transition in the photos. Interestingly, what might be the tip of a scapula projects dorsally from below the pectoral vertebrae, so maybe the forelimb lies under the sediment and could resolve the issue definitively. References- Hou, 1997. Mesozoic birds of China. Taiwan Provincial Feng Huang Ku Bird Park. Taiwan: Nan Tou, 228 pp. Chiappe, Ji, Ji and Norell, 1999. Anatomy and systematics of the Confuciusornithidae (Theropoda: Aves) from the Late Mesozoic of Northeastern China. Bulletin of American Museum of Natural History. 242, 1-89. Chiappe, Marugan-Lobon, Ji and Zhou, 2008. Life history of a basal bird: morphometrics of the Early Cretaceous Confuciusornis. Biology Letters. 4(6), 719-723. Li, Wang and Hou, 2010. A new species of Confuciusornis from Lower Cretaceous of Jianchang, Liaoning, China. Global Geology. 29(2), 183-187. Martyniuk, 2012. A Field Guide to Mesozoic Birds and Other Winged Dinosaurs. Vernon, New Jersey. Pan Aves. 189 pp. Elzanowski, Peters and Mayr, 2018. Cranial morphology of the Early Cretaceous bird Confuciusornis. Journal of Vertebrate Paleontology. 38(2), e1439832. Navalón, Meng, Marugán-Lobón, Zhang, Wang, Xing, Liu and Chiappe, 2018. Diversity and evolution of the Confuciusornithidae: Evidence from a new 131-million-year-old specimen from the Huajiying Formation in NE China. Journal of Asian Earth Sciences. 152, 12-22. In lieu of my original post plan, I just got results from Scott on the most recent analysis of the Lori matrix. This includes the Archaeopteryx, Ichthyornis and confuciusornithid skull updates unlike the version in the manuscript, plus some added taxa. The good news is that basic maniraptoromorph topology and Lori's position stayed the same, but you won't be getting any of that today. Previously, I looked at the non-theropod Lori matrix topology to demonstrate how using maniraptoromorph characters for basal dinosauromorphs will fail even given several hundred accurately scored characters with complete taxonomic coverage. Well, here's the non-tyrannoraptoran results of the full taxonomic coverage analysis. It's a majority rule tree, and you can see that fragmentary taxa can fall out in the wrong place due to both a lack of certain characters and the vagaries of tree generation. So no, I don't think Archaeornithomimus bissektensis' holotype femur is abelisaurian, and the analysis presumably found it to fall out in numerous positions within Avepoda in the most parsimonious trees. But this gives you a good overall view of what the Lori characters have to say, and it's pretty interesting in some areas. 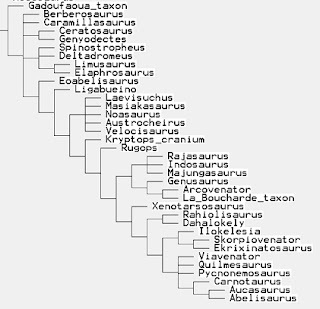 I would never publish this tree without including characters relevant to carnosaurian, megalosauroid, ceratosaurian, etc. phylogeny, so I don't mind sharing it here. It's largely good. The weirdest part is tetanurine coelophysoids. Also odd is that Sciurumimus and Chuandongocoelurus don't fall out close to their published positions. Gualicho is a ceratosaur here, so take take from that what you will. Valdoraptor emerged as a ceratosaur, but the Angeac taxon came out as an ornithomimosaur and Thecocoelurus as a therizinosaur. None of these taxa are in the Lori manuscript matrix since they had such unstable positions and so little of the Angeac taxon has been published (based on the mounted specimen, it looks very ceratosaurian). The coelophysoid grade section actually looks pretty good. Gasosaurus as a piatnitzkysaurid? Reminds me of PDW. Xuanhanosaurus and the contemporaneous Kaijiangosaurus sisters? Synonyms? I'm rather surprised at the retention of Megalosauroidea, which I usually think is a tenuous grouping. I don't trust the structure in it, though there is a Spinosauridae (with probably wrongly placed Magnosaurus). We get a paraphyletic sinraptorid base instead of a big Carnosauria. Yangchuanosaur Bicentenaria might be worth looking into. Australovenator and Fukuiraptor are allosaurids/carnosaurs unlike other megaraptorans. Congrats, Molnar. ;) Kelmayisaurus as a carcharodontosaur is surprisingly in line with Brusatte et al. 's results given how fragmentary the material is, and Labocania as one is certainly interesting. Megaraptorans sister to Tyrannoraptora has been my pet hypothesis for a while and shows up again. Hmm. It all goes to show you that you can't just take one character list and expect it to give you the right results. Topology is highly dependent on both character and taxon inclusion, and even if a matrix has more taxa and/or characters than another, you should never trust it to be better unless it includes all the competing data.